Today is beautiful out. We got up early and played inside, though we hung a load of wash on the line this morning. Then we ran our errands--vote, library, craft store and dollar store, pet store and grocery store. 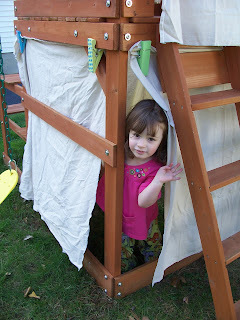 Then we came home an played outside.I pulled out the box of clothes and clips I got and sewed for Hazel's swingset. Her first response was her normal one..."No, no! I don't want them. They will blow away!" But after I started hanging them she realized they wouldn't blow away and wanted to start help hanging them. She loves her outside house. 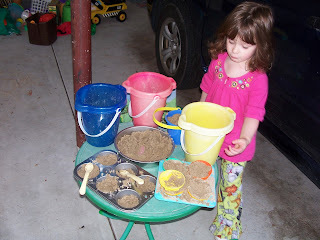 We also played with her sandbox. I bought her a cake pan, a muffin pan and some measuring cups at the Dollar Tree today, so she decided to bake a sand cake and cupcakes and we had a birthday party. We left it set up to have another one for when Daddy gets home. We have moved her sand table into the garage so she will be able to play with it all winter. Our garage is well insulated so it doesn't get too cold in the winter. I think I'm going to make her an oven out of a cardboard box for the garage and outside (in the summer) for her mudpies and sand cakes. We have the box from her car seat saved so I could use it for something, and I think this is my something. A quick craft to share. On Sunday we worked on some new napkin rings. Here are the ones we made for ourselves. 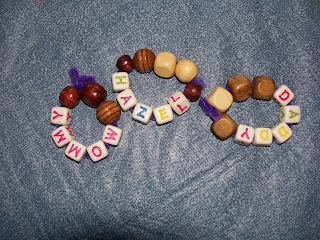 Steve and I spelled out the names/words and helped Hazel get them on in the correct order, but then let her do the other beads. 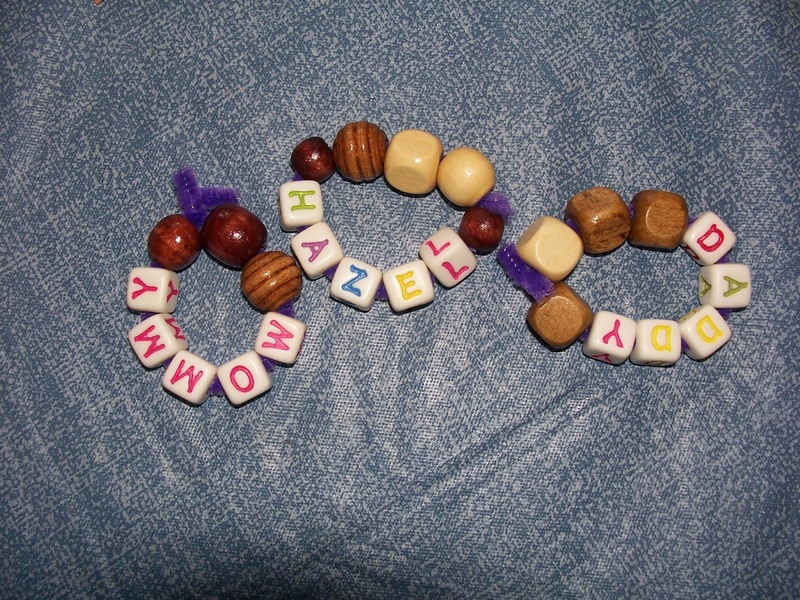 We made other personalized ones for our family and friends for Christmas gifts from Hazel and I also did other Christmas kind of words--joy, hope, faith, Christ, Thank God, etc. I may bring these to our church for the Breakfast with Santa Children's market. Maybe I'll make some nice cloth napkins to go with them. From Joyful Toddlers: Fall Celebrations: Martinmas. Great information about the Martinmas celebration including a story to share. Martinmas is on November 11th, so this Friday. We made a lantern at school and will be making more this week. From Bending Birches a link to a film on vaccinations. It seems to lean towards not vaccinating but does try to show both sides pretty fairly. It is only being presented free through today, so go check it out. I know I believe in vaccinating, but am always curious about the studies, etc. Of course yesterday one of my friends posted something about parents buying lollipops on-line that were licked by a kid with chicken pox to give their kids. Which I thought was disgusting (and so did the friend). Who knows what other diseases, etc. are on the lollipop. Lollipops licked by a kid with chicken pox? That's a bit extreme. We don't vaccinate, but information is always good to share. We won't be buying those lollipops either. Looks like you've been having a lovely day up there! Enjoy the sunshine! Love the play house and the sheets idea! How fun! Thank you so much for posting in the outdoor link up this week, I love your outdoor house, it's not unlike my outdoor reading area I have created in my post. I love those clips you have. What fun you & your little one are having - I look forward to following your blog some more, thanks again for sharing. wow love that play structure. 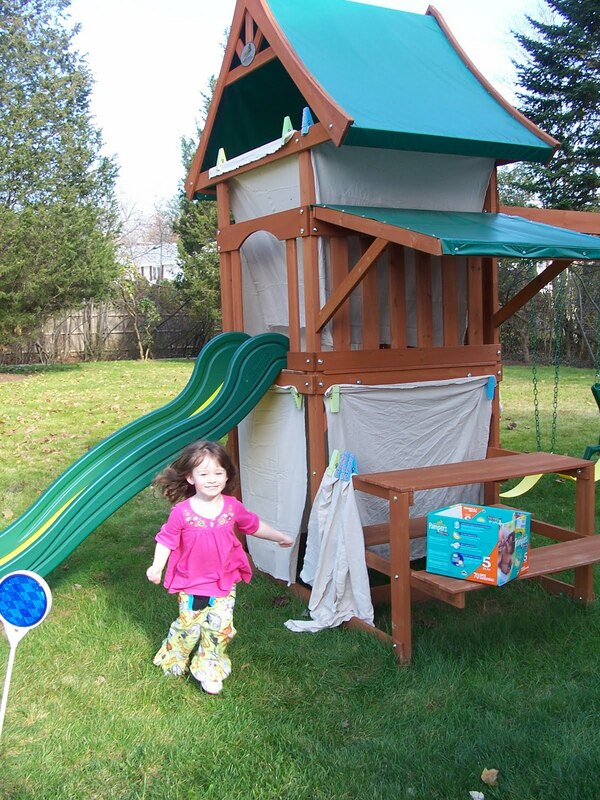 What a clever way to make a cozy playhouse! Thanks for sharing at the Outdoor Play Party!